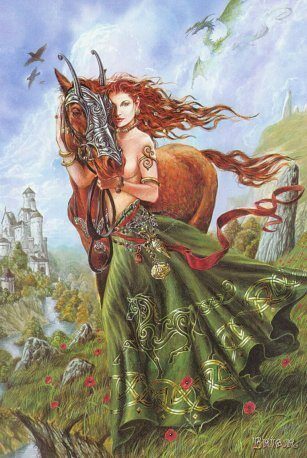 Aine, ancient Irelands preeminent Go0ddess is a spirit of love, desire, and fertility, protecting humans from illness. As late as the ninth century she was called Irelands “Magna Mater” or Great Mother. Aine was never lost or forgotten in Her influence. Post-Christianity, she was reclassified as a Faerie Queen. She also sometimes masquerades as Saint Anne. Beautiful Aine is an autonomous spirit, answering only to herself, taking lovers as she chooses, men and spirits alike. She has had liaisons with many men, bearing human children. She married Gerald, Earl of Desmond. Stories vary as to whether Aine captured him or whether he, discovering her bathing in the river, stole her cloak (like a swan maiden’s feathers or a seal spirit’s skin), refusing to return it until she married him. Their son, Geroid Fitzgerald, lives beneath Lough Gur. He rides out once every seven years on a while horse, but, legend says; he will someday emerge to rid Ireland of all invaders. Aine is invoked for assistance with love and romance as well as for protection. She can heal infertility as well as many other ailments and can bestow the gift of fertility to women and men. MANIFESTATIONS: She manifests as a beautiful woman or a red mare. Aine sits on what is called the Birthing Stone in Lough Gur in mermaid form combing out her long hair. She makes appearances on Cnoc Aine in the form of a wizened old woman. Those who greet her politely and graciously meet her mild demands receive good fortune. Those behaving otherwise learn the meaning of the word trouble. TIME: Aine is at the peak of Her power at the Summer Solstice. Her Rituals are held on Midsummer’s Eve. Torches of hay and straw were waved over crops, cattle, and women to transmit Her blessings of protection and fertility. The festival of Lughnasa, now associated with Lugh may have originally been dedicated to Her. The three days before Lughnasa were dedicated to Aine, an older Deity than Lugh. PLACES: Aine lives in a marvelous castle at Cnoc Aine (Aine’s Hill) near Munster’s Lough Gur. A twelfth century text reports that this hill was given to Aine until the world’s end. Lough Gur belongs to her, as do The Pap’s of Aine, a pair of breast-shaped mountains, considered her embodiment. She is also embodied in the isle of Knockadoon, whose form resembles a squatting pregnant woman giving birth.